The days of the "cookie-cutter" wedding are long gone - but how do you find just the right look for your big day? Start with something meaningful to you. Did you get engaged in Italy? Do you have a hobby that you both love? Start by incorporating touches that reflect your life together as a couple. Before you send save-the-dates, create a monogram, motif or other design that you can incorporate into all of your printed materials. 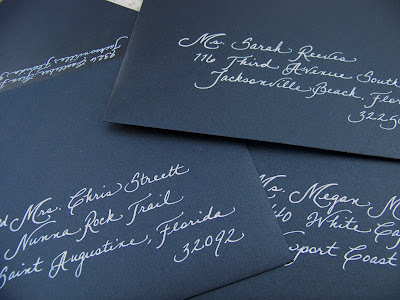 Just remember, your monogram should not include you new last name initial until after the wedding. Work with your cake baker to create a custom design that reflects the look of the reception. Your cake is an important focal point for your wedding (and especially your photos!) so don't skimp here! Tie your reception menu in with your theme. Or, incorporate your favorite foods or family recipes! Most chefs are willing to discuss custom options, all you have to do is ask. Don't forget to add tablecloths, chair covers, and other decor to match the overall look! Get out of the office on your lunch break, and take a walk. If your job requires you to sit in front of a computer all day, take several breaks during the day to stretch. Even if you can't leave the office for lunch, don't eat lunch at your desk. Exercise regularly - even a game of catch with a friend or a walk with your dog will help clear your mind. Allow extra time to get to appointments - plan to arrive 15 minutes early, in case there is traffic, road closures, or you get lost. You should still arrive on time without being stressed! Don't be afraid to ask questions or ask for help. Keeping things bottled up won't solve a problem. When you are feeling stressed about something, ask yourself, "Is this really important?" or "Will this matter a year from now?" Do something creative. Doodle on a notepad, paint a picture, write a poem - anything different from your ordinary daily tasks. I know: half of you are reading this saying, "what's a first look?" More and more frequently, brides and grooms are seeing each other before the wedding ceremony, even if their religion doesn't dictate doing so. It takes the pressure off, and allows a lot more time for photos. Plus this leaves time for the bride and groom to enjoy cocktail hour with their guests! Choose a great location for your first look. It should be interesting but private. Ask your bridal party to wait in the distance so that you two can have a few private moments together. Be prepared to cry - both of you. Have tissues handy! Be sure to talk to your wedding pros in advance. They may have ideas for locations at your venue that will look great. Let your guests know as soon as possible, so that they can change or cancel travel arrangements with the least amount of penalties. If invitations have not been mailed but the date has been announced, send a simple card explaining that the date has changed. If invitations have gone out, the guests will need to be notified by phone. Depending on the situation, you may want to enlist the help of family or close friends to make the calls. Ask your vendors if your deposits can be transferred to your new wedding date. Even is you don't have a new date just yet, they may agree to apply the deposit if you re-book within a certain period of time. If you can't re-book a vendor, ask if there is something else you can get for that money. For example, if your reception was scheduled at a country club, see if you can get a club membership, or host another family event there instead. All couples should look into wedding insurance. It can cover fees, deposits, etc. in case of a last-minute cancellation due to illness or death in the immediate family, as well as severe weather or major transportation shutdown. If you are in the market for a wedding gown, you may have seen invitations to trunk shows. And you may be wondering, what is a trunk show, and should I go to one? A trunk show is typically one or two days, where the designer or their representative travels to a bridal salon to showcase their new line. Most salons have limited space for display and may not be able to have an entire line on hand - this gives you a chance to see more variety from a designer. Make an appointment! Time slots usually fill up fast. Talk to the designer or their rep about changes you'd like made to the dress - they should be able to easily tell you what will work and what won't. Ask about discounts. There may be special incentives for ordering at the trunk show, or you might get those little changes (adding length, changing the neckline, etc.) thrown in for free. Our friends at Sharon Batten are having a Ramona Keveza trunk show this weekend. Call the shop at (904) 285-4544 for more details. What type of equipment do you use? Is it professional-grade? It's not important to get into too many specifics here, but the thing you want to know about is resolution and print size. If a photographer is using a camera from Best Buy, the resolution may not be high enough to create the wall-size portrait that you want. What is your backup procedure? Most pros will "dump" their media cards (usually similar to what is in your point-and-shoot digital camera) as soon as the wedding is over and back everything up to CD or DVD. But what happens from there? Is there an external hard drive backup? Does a copy get stored off-site in case of fire, theft or other damage at the studio? Also regarding backups, how long are your images stored? I was recently at an industry event where Master Photographer Susan Michal was addressing this issue - she has backups for every wedding she has ever shot. This might seem extreme now, but what happens if your house burns down in five years? Wouldn't it be great to know you can turn to your photographer to still have your wedding images? How many images are edited? If your photographer gives you a CD or DVD as part of your package, find out if these images are edited for color correction, etc. Can I see images from an entire wedding? Often a photographer might show you an album with one or two of the best images from several weddings - ask to log in to their online proofing website to see a full wedding. What are your emergency procedures? Do you have backup equipment? Do you bring it with you? What if something happens to you on the wedding day, can you send another photographer? For brides and grooms planning outdoor weddings, it is crucial to have a backup plan! We had a beautiful wedding on Saturday (more to come on that!) but if we had not had proper planning it could have been a disaster Saturday's forecast called for a high in the low to mid 50's... a 20-degree drop from our average this time of year! Luckily, we had planned well in advance to not only have a tent but also heaters. About a month before the wedding, we even added the side walls for the tent to keep the heat inside the tent better. On Saturday morning, I arrived at the site, and not only was it in the high 40s, but it was raining. No worries though! Our tent was warm and dry and looking beautiful. And by the time the ceremony was over, the sun was even making a guest appearance. Do you have adequate restroom facilities? What will happen if there is inclement weather? Don't just think about temperature or rain - what about high winds? What is the cancellation policy if you don't need the tent/heater/etc.? What is the ground like - is it even? If it rains, will it be soggy? Where will your vendors load in? Is there enough parking for your guests? If you are thinking of hiring a planner/coordinator, be sure they have worked with this type of venue before! There are lots of little things to think about, and you don't want to realize you need to think about them when it's too late. Hopefully, you attended Sunday's bridal show at the UNF University Center. And hopefully, you left with a giant bag full of information. So now what? I'm guilty myself. Especially at the home and garden shows. I come home with all these great brochures and then they sit there, still in the bag, for a couple months until I throw the whole thing out without even looking at it again. Let's start by sorting. Hopefully sometime this week, while everything is fresh in your mind! Pull out the brochures and postcards and flyers for the companies that really stood out in your mind. That stack is priority number one. Check out these companies' websites, or call to set up a meeting. The next stack is for services you still need. If you've already booked your photographer, throw out all of those brochures. Even if you don't think you'll need a particular service, keep that brochure in the stack. You never know! Now sub-divide pile #2 into the services you are currently looking for and those that you might need or ones you will focus on later. For example, you need a cake but haven't booked your venue yet; put the cake brochures in a "later" pile. Anything that is left and doesn't fit into any of these categories, throw away! Eliminate as much clutter as possible in your wedding binder or file. The exception: see if there are any photos you can use for inspiration, and clip them out. Hopefully these tips will help you sort through the post-bridal-show chaos! Don't dance to the whole song; ask your band or DJ to play only 2 minutes of the song. Schedule at least one professional dance lesson so that you are comfortable dancing together. Learn how to lead and follow, which foot to step with first, and other basics. Start practicing a few months before the wedding (not the week of the wedding!). Make sure your band or DJ has the same version of the song that you have been practicing with. If there is any doubt, give them a copy of the CD. If you plan to choreograph your dance, be sure to keep your wedding dress in mind. There may be a lot of added weight and fabric for your new husband to dance around! If both moms live close by, or will be in town at the same time, plan a girls' shopping day. Have lunch at a nice bistro, then shop for both moms' wedding attire. Ask your mom for "something old" and his mom for "something borrowed" for the wedding day. This is another great way to include family heirlooms! If you are putting a dance floor on grass or another uneven surface, you will need a plywood sub-floor underneath it. Be sure to ask your rental company to include this in their quote, because it will affect your price! If you are laying a dance floor on a smooth, uneven surface (such as stone), you may need carpet underneath to keep it from moving around. Tent flooring can make any surface level! Work closely with your rental or event design company to design a space that works for you. Ask you venue about any special requirements well in advance, preferably before signing a contract. So you're engaged. Now what?! Your first instinct may be to pick a date. It's not a bad place to start, but there are lots of factors that can affect that date. Some couples have a special date that is significant to their relationship, and nothing is more important than that date. These couples may need to be a little more flexible on location, budget, or guest list. For others, they simply must have 350 people on their guest list - here in Jacksonville, that means that their venue options are a bit limited. If an oceanfront wedding is most important, the couple may want to think about a Friday or Sunday wedding if they choose a popular venue. Once you have a list of your priorities, you can look at your budget and decide how much to spend in each area based on its rank.